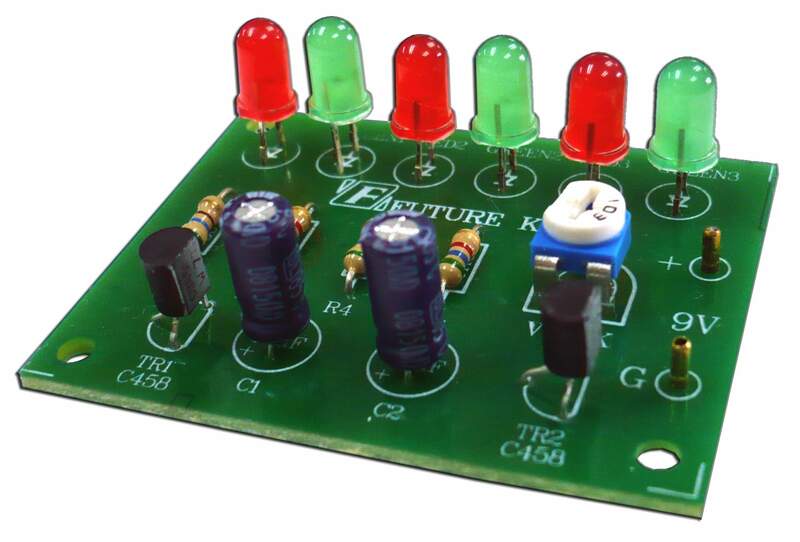 This kit enables six 5mm LEDs to flash on alternately at a time. The flashing speed is adjustable! Perfect kit for a beginner as there is a lot of room on the board to solder! - Power supply : 9VDC. - Display : Six 5mm LEDs.- Adjust flashing speed with potentiometer. - PCB dimensions : 2.04 x 1.60 in. - LED colors pictured are subject to change without notice! FK1200 Series kits designed for beginners. Fairly simple kits on larger boards and fewer components for easy assembly.